When the trailer for the HBO film The Normal Heart premiered months ago, I was floored by the brief look at the film and my wife and I circled May 25th on the calendar immediately. It seemed as though it would certainly be a top tier production by the stellar network, a gut wrenching look at the onset of the HIV/AIDS virus but also an informative film about the world that was then before my time, a world that was filled with panic and confusion over the lack of answers regarding the deadly disease. While I highly enjoyed the film and was filled with heartbreak over the characters depicted and the stirring performances that gave them life, I was surprisingly a tad disappointed over the complete vision being portrayed here. 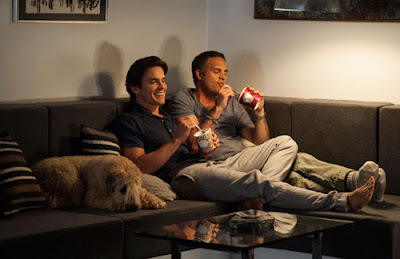 Prior to watching The Normal Heart, I was not aware that it was an adaptation of a Broadway play but that quickly became apparent because the film followed a style similar to a stage performance, focusing on a specific group of people during the onset of a worldwide problem, bringing us scene after scene of intense dramatic moments between these friends, colleagues and lovers while maintaining a rather limited scope for such a big story of human history. I suppose had I come into the experience knowing what to expect it may have played a bit stronger and with more power for me, but as I was expecting a much broader look at the impact AIDS had on the entire homosexual culture and humanity as a whole I couldn't help but be left slightly cold due to greater expectations. On a performance level, almost every moment worked wonderfully which is why I still admired the film despite my slight issues with its limited narrative. 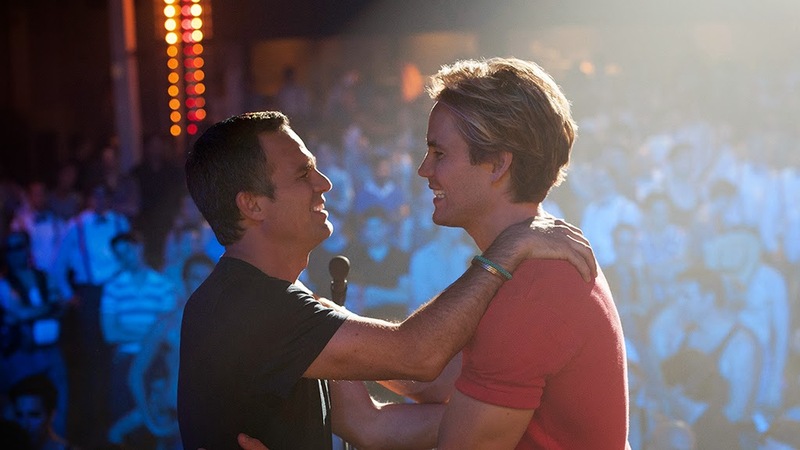 Mark Ruffalo was the lead of the film, playing Ned Weeks, the self appointed leader not by title but through action of the gay rights movement during a time when no one seemed to give a damn whether they lived or died. He was solid and did nothing to detract from the film but at times his constant barrage of anger filled rants made me grow weary of sequences that demanded more quiet eloquence and emotional resonance. I couldn't help but let my mind wander and consider the possibility that he was practicing his role as the Hulk in the upcoming Avengers sequel while filming The Normal Heart, as he was often over the edge in a rage while others played it more even and thus, more impactful. The stars of the show for me were Taylor Kitsch as Bruce Niles, the literal leader of their cause but only chosen as such because of his good looks and mass appeal to reach others with their message. Kitsch seemed to know the right way to balance a character that tried to maintain a cool demeanor despite losing lover after lover, friend after friend to the awful ailment, and I was often impressed by his turn in the film. Matt Bomer might as well clear off his mantle now for the Emmy award he will be receiving for the film, as he was stealing scene after scene as the lover of Ned Weeks who becomes infected himself, and the reason I approach his role with such confidence that it will be recognized through a trophy or two is because of the physical transformation that was asked of him to play a dying man with such authenticity. Jim Parsons found a way to move past the fact that he is known world wide for his role in a sitcom to provide a rather quiet but stirring performance as Tommy Boatwright, one of the less outwardly sexual members of their group but internally devastated by the constant loss of friends. I could go on and on about performances because director Ryan Murphy made them the focal point of the film and I am sure this worked wonders for most, as it nearly did for me. Still, I expected a bigger story about the early 80's and the landscape of society as a whole, and I didn't really learn anything new from a film that often brought a tear to my eye but never really tried to break new ground.